Lingerie brand Agent Provocateur recently launched Fatale, a new feminine fragrance with notes of Madagascar pink pepper, succulent mango nectar, exotic blackcurrant, velvet gardenia, royal orris absolute, Indonesian patchouli, sulty skin musk, vanilla orchid aphrodisiac, chocolate gourmand addiction and Spanish labdanum. (I left the original press release text intact, for your reading pleasure.) Fatale was developed by perfumer Jean-Marc Chaillan and seems to signal a change in direction for the Agent Provocateur fragrance collection. Fatale is reportedly "inspired by the 1940s Hollywood femme fatale" who "will tempt you to discover her wondrous world of dark glamour," as well as the contemporary "successful career woman who works had and plays hard." To summarize the entire press release: seduction, allure, sensuality, mystery, confidence, desire — the whole she-bang. Again, nothing that we haven't seen or read before. All the same, I hoped that Fatale itself would transcend its package and its prose. Does it? I'm afraid not. Fatale opens with a bold chocolate accord, and the fruit is there too — but the mango slices have been dipped in chocolate, the blackcurrants have been dipped in chocolate, and even the pink pepper is just a dusting over this fondue-like gathering of notes. I have to admit that this phase of Fatale is good mouth-watering fun. But the fragrance turns out to be front-loaded, with most of its emphasis on the top notes. While I was testing Fatale, I happened to read Erin's recent post about the "brief thrills" of enticing top notes that don't necessarily follow through on their promise, and I nodded in agreement. Fatale loses most of its glossy sweetness within an hour. What I'm left with is a dustier heart of powdered cocoa and some very subtle iris and white floral notes. I actually do admire the Agent Provocateur lingerie collection, which manages to be elegantly risqué without crossing the fine line into trashiness. I thought the brand's earlier fragrances were apt reflections of that style. Fatale, I'm afraid, smells more like Victoria's Secret. Why release a fruity-floral-gourmand now, when everyone else has already done it, and when Agent's early fragrances were so much more distinctive? I'm sure there are valid business reasons that I (a pure aesthete where fragrance is concerned!) wouldn't quite understand. Fatale may turn out to be very popular and may introduce a new audience to Agent Provocateur. In the meantime, I might stock up on Maîtresse, just in case. 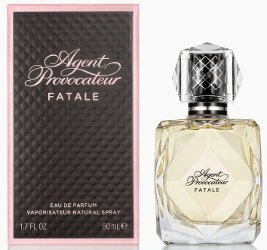 Agent Provocateur Fatale is available in 30 ($52), 50 ($72) and 100 ($95) ml Eau de Parfum. I almost wondered if it was part of the deal Monica Cruz (I think that’s her in the pic – Penelope’s sister) have with Agent Provocateur. She designed a lower priced line for them and Penelope directed one of the ads. Interesting! I didn’t know all of that. The lingerie does suit MC very well! This doesn’t tempt me at all. I’m a fan of the original fragrance and Maitresse too. I guess you will resist its dangerous allure. That, and I don’t consider myself a successful contemporary career woman who works hard and plays hard. At my job I prefer to give my company what they pay for and looking at my check, that ain’t much. Also, playing hard doesn’t sound like any fun either. Sounds tiring. I guess I’m not the target audience for this one. What a superb range of fatale fragrances are already on the market, some of them actually from the 1940s. Consider the riches: white floral bombshells, leathers, tobaccos, fruity chypres, rose chypres, orientals … Now apparently a ‘femme fatale’ fragrance is …. fruit dipped in chocolate. Sigh. I’m just giggling about “exotic” blackcurrant! I didn’t know that blackcurrants were exotic and I will now regard Ribena in a very different light. The vanilla orchid aphrodisiac was the one that got me giggling. “a pure aesthete where fragrance is concerned!” Hear hear! Well, I’m also an amateur, in the truest sense of the word! I absolutely agree with the “brief-thrills” about this one. Catch ’em with the opening lasting long enough to get ’em buy a bottle–aiming for one-timers and no-repeaters. The juice I acquired had darkened, so the “top notes” might’ve gone off, but nonetheless, wearing this made me feel a bit sick, like with LVEB and other praline-based perfumes. There are some fragrances I wouldn’t mind wearing if gifted a bottle, this doesn’t count to those. It absolutely goes beyond my reasoning how they could discontinue Maitresse and release&continue something like this, another one “the world doesn’t need (there are better+cheaper options in the celeb line-ups)”?? I really was fond of Maitresse. I still miss it! !